Timing: Shift Starts from 7am and End at 12pm, Sunday is Off. 2. We are providing bicarbonate dialysis only. 3. We have dedicated dialysis staff. 4. We have dedicated doctor for dialysis. 5. We have High flux dialysis facility. 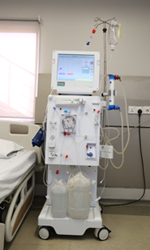 form of dialysis therapy is performed only on admitted patients.